Because really what’s more sad and lonely than this little icon when no red marker appears all weekend long…because you know you are trying to convince yourself you aren’t waiting for Mr. I’m So Not Thinking About Him to text. But you clearly are! And the worst is when your friend with her lovely, wonderful BF keeps getting texts all night long…all weekend long…barf…. 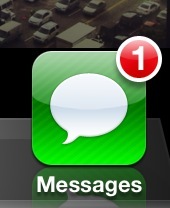 So here’s to dreaming of a day where my imessage icon will go from sad to fab!! maybe that’s from him??? But it’s probably from my mom…. This entry was posted in Sad Single Gal of The Day and tagged barf, Boyfriend, crush, imessage, iphone, sad to fab, Texting, waiting by the phone, weekend. Bookmark the permalink.